More information about Geany can be found at geany.org. Add support for real-time symbol parsing. Fix loading of non-UTF-8 templates. Update Scintilla to version 2.25. Add Scala custom filetype (werg). Add Cython custom filetype (Matthew Brush). Add support for separate single and multiline comments. Add support for filetype-specific indentation settings. Add filetype Cobol (Seth Keiper). SplitWindow plugin now works on Windows too. Update translations: ca, cs, de, en_GB, es, fi, fr, gl, it, ja, nl, pt, pt_BR, sl, sv, tr, vi, zh_CN, zh_TW. Source tarballs as well as Windows binaries can be found as always on http://download.geany.org. 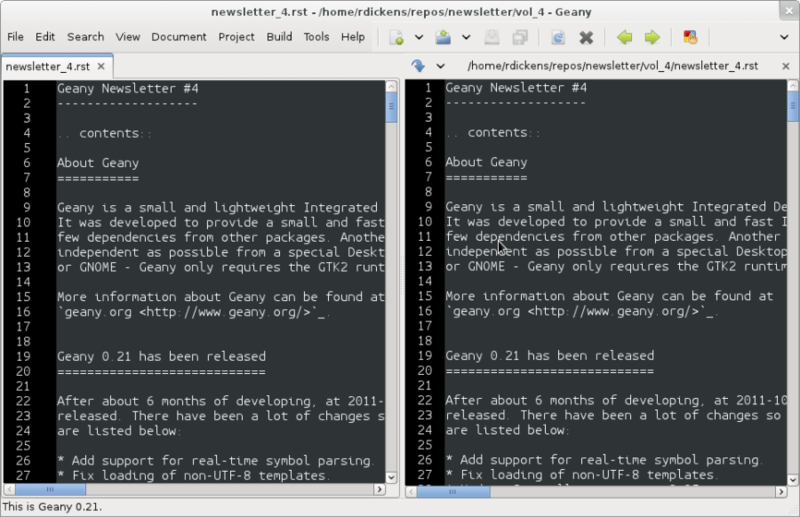 On 23 October 2011, about three weeks after Geany 0.21, Geany-Plugins in its final version has been released. As seen in former newsletters it has been a quite active time on plugin development, so we are trying to give you an overview on one hand as well as digging into some of the bigger changes that have happened. Most of the new plugins have been already described in one of the previous editions of this newsletter. However, so only a short overview is provided here. Debugger: A plugin to integrate debuggers like GDB. This is replacing GeanyGDB in many places. Devhelp: Integration for GNOME's Devhelp and google code search. GeanyPG: Encryption, decryption, signing etc. from within Geany via GnuPG. GeanyMacro: A plugin to record and apply macros. GeanyNumberedBookmarks: A plugin to store bookmarks to files and access them easily via a number. Tableconvert: A plugin to convert lists into tables. XMLSnippets: Helps on inserting (common) XML-snippets. Significant rework has been done on the Autotools build system as well as some maintenance work on the Waf-build system. Various bugfixes and memory leak fixes. Don't double free a variable which might end up in a segmentation fault when using plugin function more than once. Fix an issue with init threads for older GTK/glib versions by updating to Geany API version 203. Shortly after the major release of Geany-Plugins 0.21, an issue with the build system was found which blocked installation of source tarballs using the Waf-build system. This has been fixed inside a minor source release. The Windows binary release isn't affected by this issue. If you have been using Geany for a while and read the announcement of Geany 0.21's release, you might have noticed something important. The leadership of the Geany project has changed from Enrico Tröger to Colomban Wendling, a current member of the development team. Enrico's priorities changed so he decided it would be best if someone else took on the leadership role. During Enrico's time as leader, Geany has continued to gain in popularity and improve, whilst staying true to its original design goals. Thank you, Enrico, for all that you have done, and thanks for taking over Colomban. Together with the guys of Xfce, Geany was presented with another booth at the annual OpenRheinRuhr at November, 11th and 12th in Oberhausen, Germany -- A convention about all topics around Linux, BSD and free software in general. The booth was again well visited and people came not only to ask for help, but also just for having a little chat with Enrico and Frank and discuss about Geany releated topics. This section is intended to introduce particular plugins or features on a regular basis. The Split Window plugin provides a feature which is so useful you'll never want to be without it. When enabled, choose Tools > Split Window > Side by side | Top and bottom from the main menu and the active window is split into two editing panes. Each pane can be navigated independently of the other, complete with its own scrollbar. In each window you can edit separate parts of the same file, with each pane updated instantly with the changes made in the other. When you want to return to "normal" view, choose Tools > Split Window > Unsplit from the main menu. It's not possible to again split the active window, only unsplit. The plugin was intended to allow you to work on the same file but thanks to a "hidden" feature you can work on two different files loaded in the split view. If you open a file while in split window mode, it's loaded in the inactive pane. You can then switch between the split view of the same file or the different files via the file tabs (under the menu bar) as normal. Note that it's not possible to change the file shown in the right-hand pane when Split Window is active. Geany supports colour schemes which allow you to change the colours applied to various code elements. Two colour schemes are provided with Geany: Default and Alternate but many more are available (see below). To change the colour scheme, select from the menu View > Editor > Colour Schemes > PREFERRED_COLOUR_SCHEME. The colour scheme change is immediate but the list of available schemes is only loaded when Geany starts. More colour schemes are listed on the Geany Add-ons web page. For the individual schemes, follow the instructions given by their authors. One of the biggest set of schemes was created by codebrainz. The collection is listed on the add-ons page but is hosted at https://github.com/codebrainz/geany-themes Follow the installation instructions given on the page, then restart Geany and all schemes will then be listed in the Colour Schemes menu. Geany's colour schemes' format has changed over time, so there's a "legacy" format and the current, preferred format. Schemes in the different formats can be mixed but the current format is easier to maintain and modify. In this issue the focus is on the new format but if readers want it, the legacy format could also be featured in a future newsletter. When Geany applies syntax highlighting to a file which matches a filetype, it matches the element (defined in the filetype's file) with the matching colour (defined in the colour scheme's file). The advantage of this scheme over the legacy version is that modifying a colour scheme for all filetypes requires changes to just one file. This is the second in a series of interviews with Geany's contributors: core developers, plugin developers, translators, wiki maintainers and any other job we can think of. The purpose of the interviews is to get to know each of these people a little better: their hopes, dreams, plans and favourite Geany plugin. As is mentioned above, Enrico Tröger recently stepped down as leader of the Geany project. In this interview he talks about his history with the project. What motivates you to develop or contribute to FLOSS projects? There are different reasons. Most often it is that I want to improve existing software by fixing bugs, adding features I'd like to use and so on. So this is a rather pragmatic reason. Nevertheless, I believe in Free Software and this is another reason why I contribute to Free Software. Free Software allows people to read and modify the source code to their needs, so in theory everyone can make the software or change it to his/her needs. Based on my experience, most people push back their changes and so the developers can include them if appropriate. This is only one of the advantages of Free Software. I doubt this would be possible with paid software projects, at least not as long as they are not free. How did you become Geany's project leader? This was much simpler than you might imagine: I created the project :). What is involved in being Geany's project leader? Many different things. It all starts with knowing the project, knowing the people involved and ideally knowing the code base :). I think the project leader should coordinate the development and communicate with the community, making the project a project and not just a bunch of lines of code. Also, at least in the Geany case in the past, the project leader makes the releases though this is not necessarily a project leader task. Users, package maintainers and other external people often contact the project leader directly via mail or on IRC to say 'thank you', ask questions about Geany or to discuss project related topics. So this is another task for the project leader. And certainly there are many other aspects which I forgot to list. What goals did you have when you started as project leader? Did you achieve those goals? As I didn't explicitly start as project leader but instead just started the project, I didn't have any specific goals to achieve as project leader however I did have goals to achieve with Geany as project. These goals mostly were to create an editor which fits my needs so that I can use it to write code and other text documents without thinking about the editor, how it behaves, why it is so slow or doesn't do what I want. As you see, these were quite personal goals. In the meantime, as those goals basically were achieved with Geany 0.1, the goals changed to be more general: a light and fast editor with basic features of an IDE, without unnecessary dependencies to other libraries yet with useful features. Oh, and we achieved these goals as well though that doesn't mean Geany can't get better anymore. There is always room for improvements and new useful features. What were some of the highlights of your time as project leader? Hard to name particular highlights. One great thing which kept from the beginning to now is to receive mails from users who just say 'thank you, Geany is great program'. This is always great to read and always increases motivation to continue working on Geany (in whatever way). I didn't experience anything like this before and would have never expected it. But it's really nice. Maybe another highlight worth mentioning is the many things I learned during time working on Geany. This includes learning how other people use Geany or certain features of Geany, to work with the community and to read other people's code and learn from it. Are there particular improvements/change/features of which you're proud? The community. Ok, the community is not an improvement, change or feature :). But this is what Geany makes Geany. Without the many users and contributors, Geany would not be as cool and as stable and as feature-rich as it is now. Thank you all for using and improving Geany, keep up! How does a FLOSS project balance welcoming contributions with keeping within the project's original goals and scope? In other words, avoid scope creep? In Geany's case, luckily there were not much conflicts in accepting new features and the overall goal to keep fast and lightweight. However, I think a few times we had to deny a feature request for such reasons or because it the requested feature didn't fit into Geany. This went much better since Nick introduced the plugin interface so that features which don't fit into Geany's core, can be easily implemented as a plugin. Nevertheless, denying a feature request, especially when it was obvious that it would actually help the user who requested it but still doesn't fit into Geany, was hard for me. It's like "I decide that you will not get this functionality". Not a nice job. As said, luckily this didn't happen so often. Do you have any hopes or dreams for Geany's future? Of course: Geany should stay on its road it has been all the time. This is, keeping fast and lightweight while offering many useful features to the user. Moreover, I really hope and wish, the current fast and intense development in the community keeps going so that Geany will evolve further and get even better than it is already :).